Communities inside Eastern Aleppo have lived under one of the longest lasting sieges of modern history, with limited access to basic necessities, such as food, water, and medical aid. Earlier this week, the Syrian regime and forces loyal to it have forcibly displaced tens of thousands of citizens of Eastern Aleppo. Recent reports indicate that families are being evacuated to Idlib province in northern Syria. Karam Foundation is working with a group of local NGO's to provide emergency aid to the people of Eastern Aleppo. An estimated 100,000 people will be evacuated from Eastern Aleppo -approximately 20,000 families. The aid provided is intended to address their immediate needs -including basic necessities such as food, heating supplies, and shelter. December 25: Our team delivered emergency aid to 25 internally displaced families from Aleppo that were relocated to Maarat al Nouman and Benin in Idlib province in northern Syria. "Today we distributed emergency aid to the families arriving from Aleppo to the areas of Al-Jineh and Al-Atareb. The evacuations are still ongoing towards rural areas west of Aleppo and northern Idleb. The snow and freezing rain has shut down many of the roads. It is very cold here. New camps are being constructed for the tens of thousands of displaced people from Aleppo. Local school buildings are being used as shelters for the families as well. The situation on the ground is chaotic and devastating. 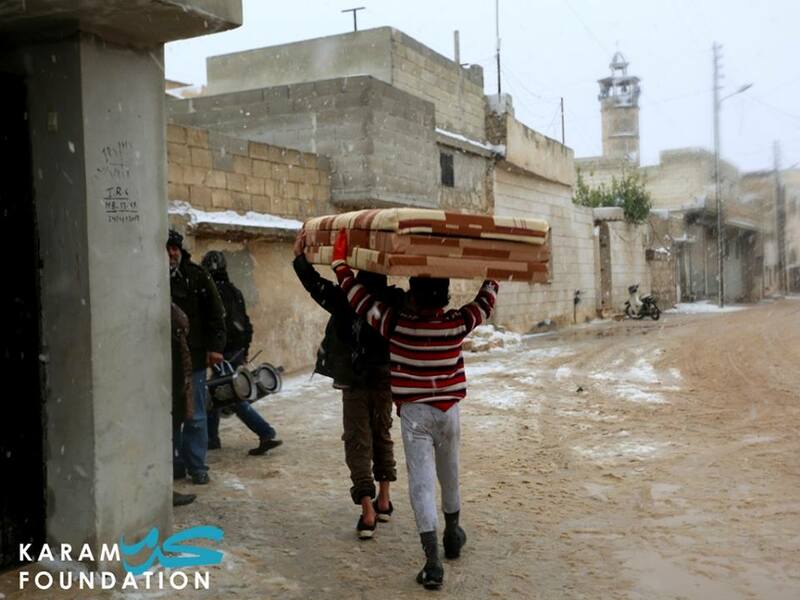 In the past week, Karam Foundation has provided emergency aid to 1000 families (approximately 5000 people) across various areas in rural Aleppo and Idleb. We also prepared shelters for families in 3 school buildings in Atareb and a safe house for families on route to Idleb. We distributed mattresses, heaters, heating fuel, and food baskets. We are now preparing emergency aid for another 1000 families. Our team is working around the clock between preparing aid and the distributing it to the families. The families have left their homes in Aleppo after living under siege for over 110 days, they lived under constant aerial bombardment and then were told to leave their homes with nothing but the clothes on their backs. They have no homes, no clothes, no work, no income, no vision for their children's futures, and no hope. They now must rebuild their lives from nothing." 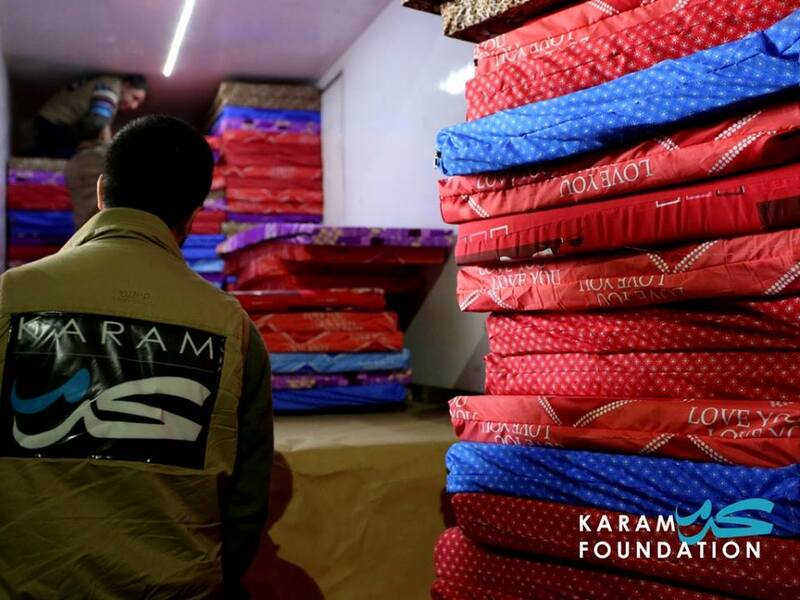 December 18: Karam Foundation's team in Syria delivered 1500 mattresses and 500 food baskets to families who were forcibly evacuated from their homes in Eastern Aleppo. All of the food baskets contain ready-to-eat items; no cooking needed. 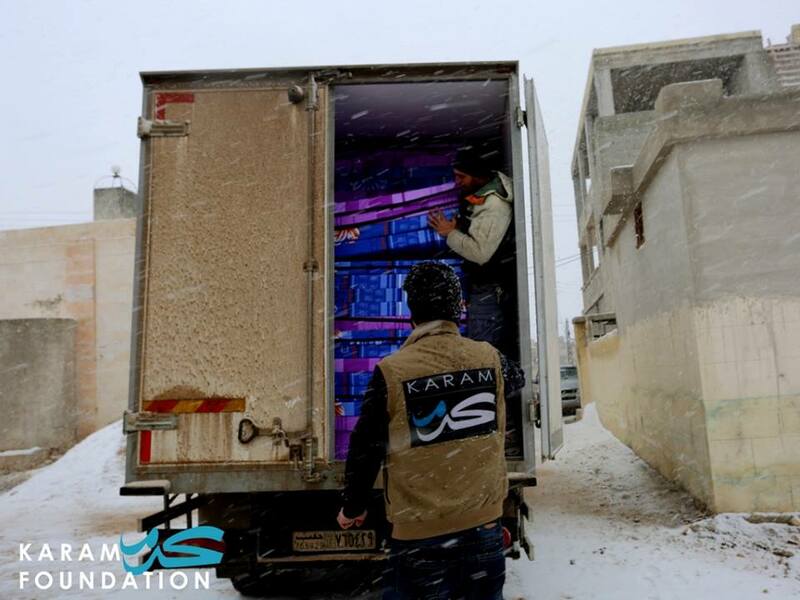 DECEMBER 16: Karam Foundation's team in Syria delivered 500 heaters today to families who were forcibly evacuated from their homes in Eastern Aleppo. These families are being sheltered in unheated school buildings. Each school houses over 100 families. When our team met the families, they were shivering from the cold. They were so grateful that help arrived to them so quickly. Our team is planning to deliver 1500 mattresses and 500 food baskets to be delivered to families on Sunday, December 18. 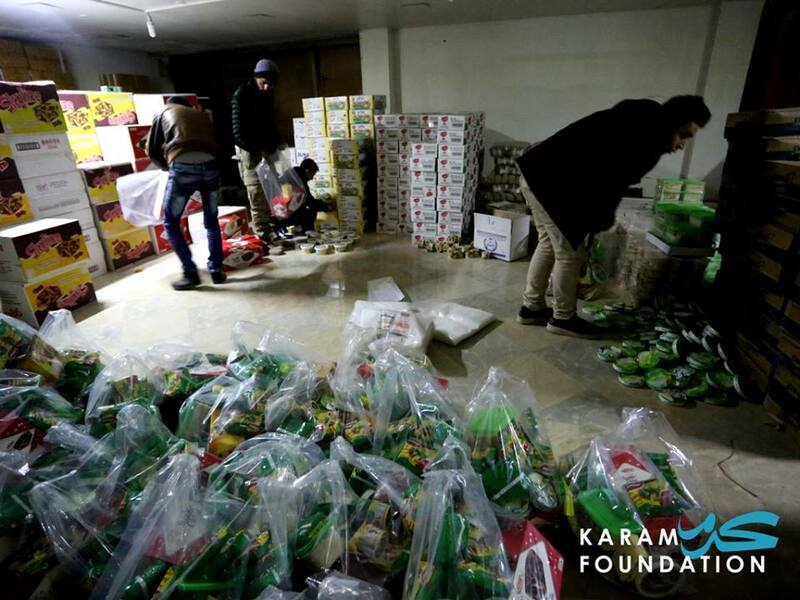 Karam Foundation is proud to be one of the very few organizations on the ground delivering aid to people in need. We will be posting our updates periodically. Thank you to everyone supporting our efforts. The Karam Foundation Team mourns the horrific deaths of hundreds of civilians in Aleppo. We mourn the brutal destruction of one of the oldest cities in the world. Most of all, we mourn the death of collective humanity itself, which is witnessing genocide in utter silence. On dark days like these, it is difficult to continue our humanitarian work, but with millions of abandoned Syrians suffering from lack of basic necessities, it is our duty to continue. We will never stop serving Syrians in need. We will never stop investing in Syria’s youth —the only future left for the country. We will never waver from our demands to protect civilian life, always and everywhere.